Ever since Kirker first launched a brochure in 1986, their aim has been to provide discerning travellers with a carefully selected range of hotels that provide excellent service and comfort, combined with private transfers, private tours and well researched itineraries. 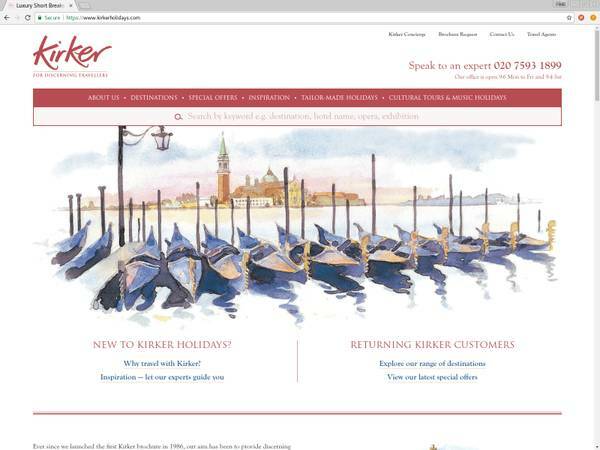 One of the key objectives of the Kirker website was to carry on the distictive brand from their brochures, develop the functionality of their existing website and future proof it with a modern responsive custom template designed specially for them. We have used a powerful indexing system to catalogue both the Accommodation listings, the Group Holidays and the Tailormade holidays which enables us to filter the search results by multiple criteria in an instant. Key to this project was to provide a mix of Short Breaks and longer trips in a sensible and understandable way. Key to most people's requirements is for a website that looks good no matter which device the site is being viewed on. Mobile was key to the design process rather than an 'add on' process. This has resulted in a fast, beautiful and useful website, no matter which device is being used. Try it for yourself on your phone! Most importantly, when planning a successful travel website project, it is essential to engage a partner who knows the complexities of the travel industry. Mr Zen was established in 2008 and has been producing complex, mostly bespoke and ground breaking websites within the specialist travel industry ever since. The directors have specific knowledge of tour operation, having backgrounds in Small Group Adventure Travel, Sailing Holidays, Ski and many other small to medium sized tour operators.